These Brown Sugar-Bacon Buttermilk Waffles are light and fluffy, and include bits of brown sugar-glazed bacon in the batter. Truly the perfect waffle for any serious breakfast lovers! You HAVE to make these waffles immediately. Believe it or not, years ago, this was the very first legit homemade waffle (i.e. not from a Bisquick mix) that I ever made, and boy was I happy to make the discovery. Once I made these, I never looked back! Picture this: Bacon that is topped with brown sugar and then baked in the oven so that the brown sugar caramelizes into a glaze on top of the bacon. Then a homemade waffle batter made with buttermilk that is thick, lumpy, and creates the perfect waffle. 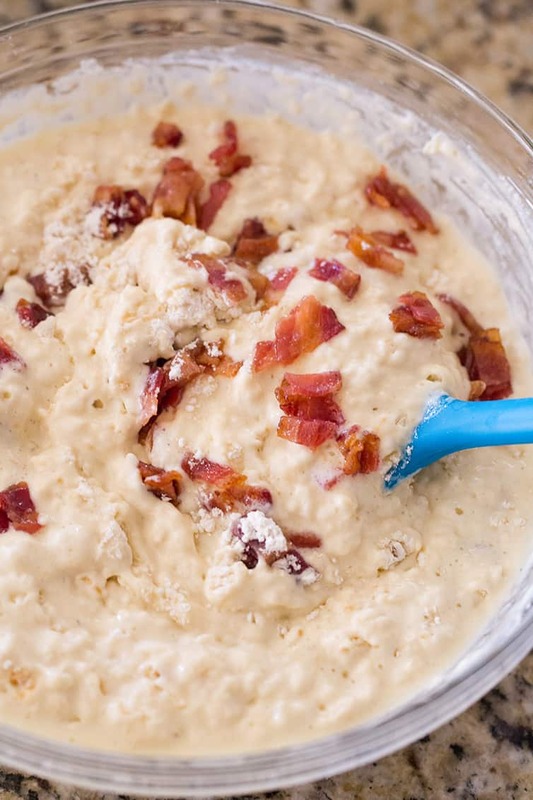 Mix the bacon into the batter, scoop onto the waffle maker and, voilà! 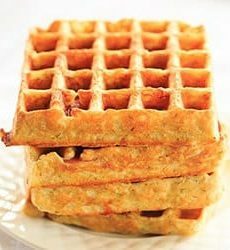 Waffles that combine two of my favorite breakfast foods. 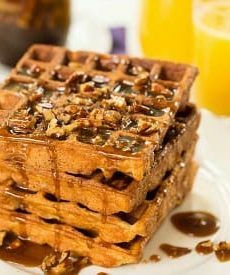 The bacon is already in the waffles, and then you douse on the maple syrup – all of those wonderful breakfast flavors in one bite. You seriously cannot go wrong with this recipe. Make them for house guests (or your husband and toddler, AHEM) and you will be a hero. I know some of you may ask about my waffle maker; I have this Breville model and I absolutely love it! I used to have a round Belgian-style waffle maker, and I think this one is infinitely better. There are a number of settings to ensure that you really cook up that perfect waffle! Quick tip – you mayyyyyy want to make a little more bacon than the recipe calls for because it’s highly likely that you’re going to sneak a bunch of it while you’re chopping it up. Or is that only me? I can’t keep my hands off the brown sugar-glazed bacon! 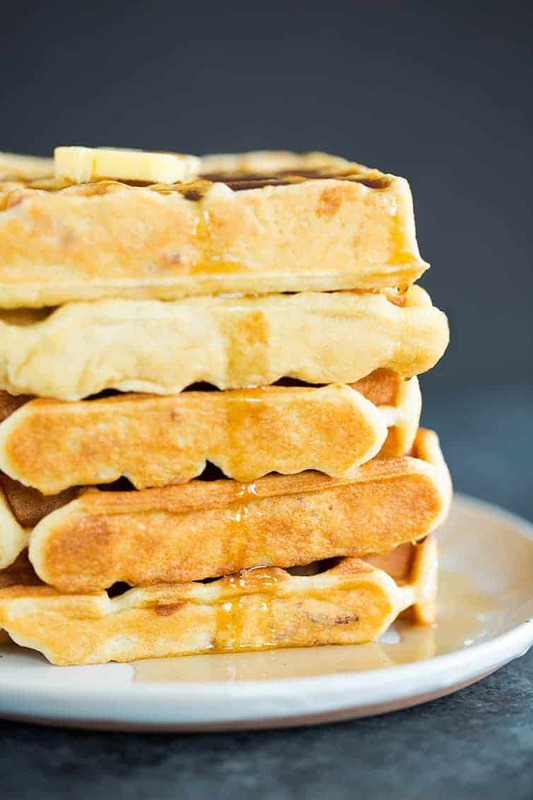 This recipe makes a large amount (about 11-12 square waffles or 7 Belgian style) so it’s perfect for feeding a crowd or if you want to stock your freezer for ready-made breakfasts (my preference!). If you’re a bacon lover, you are going to go BANANAS for these waffles! They cook up crisp on the outside and super soft and fluffy on the inside, which is basically waffle perfection. Head on in to the kitchen and make some of these brown sugar-bacon buttermilk waffles! 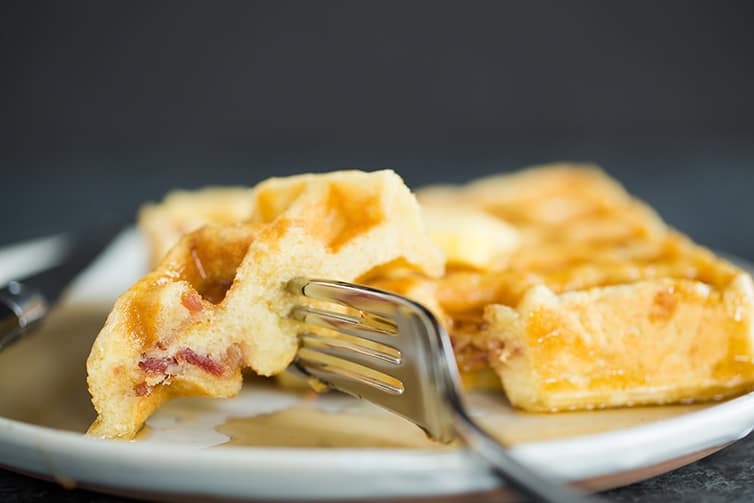 These Brown Sugar-Bacon Buttermilk Waffles are light and fluffy, and include bits of brown sugar-glazed bacon in the batter. Breakfast of champions! Make the Bacon: Preheat oven to 375 degrees F. Line a baking sheet with parchment paper, a silicone baking mat, or spray a baking sheet with non stick cooking spray and line with foil. Arrange bacon in a single layer on the baking sheet. Sprinkle generously with the brown sugar. Place in the upper third of the oven and bake until sugar is caramelized and bacon is brown and crispy, about 10 to 15 minutes. Remove from oven. Immediately remove bacon slices using a pair of tongs. Place them on a cutting board (not paper towels, they’ll stick!) to cool. Once cool, chop the bacon into bite size bits and set aside. 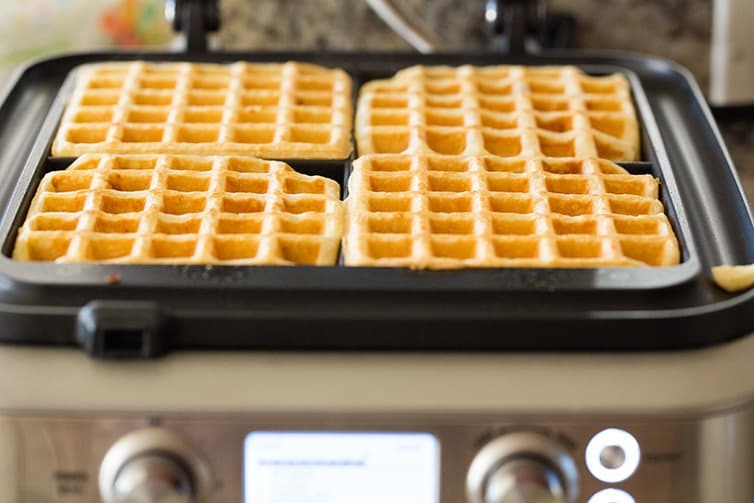 Make the Waffles: Preheat your waffle iron. In a large bowl, whisk together the flour, baking powder, baking soda, salt and brown sugar. In a medium bowl, whisk together the eggs, oil, buttermilk and vanilla extract. Add the wet ingredients to the dry ingredients and fold with a rubber spatula. Once almost fully incorporated, add the bacon and stir. Mix only until most of the dry ingredients are moistened in the batter; like pancakes, it's good to have a lumpy batter. Cook the waffles according to your waffle machine instructions. Serve with butter and maple syrup. 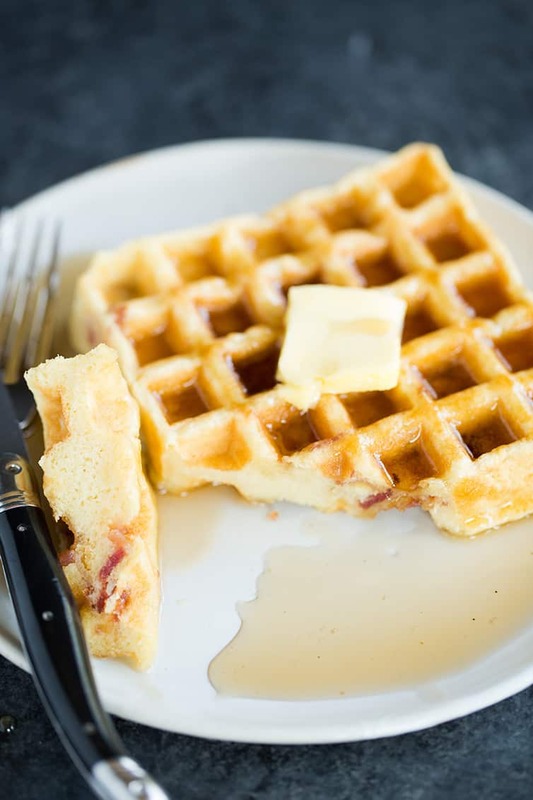 Leftover waffles can be stored in an airtight container in the refrigerator for up to 4 days, or wrapped in plastic wrap and placed in a ziploc freezer bag and stored in the freezer for up to 2 months. My favorite my to reheat them (whether fresh or frozen) is in a toaster oven. This recipe was originally published on August 3, 2009. What an awesome idea!!! I’ll be trying these on my next long weekend! Also, I might start putting this bacon in everything. A very good recipe and the buttermilk has made a great difference in the flavor! Trying them 4 times however, my waffles tend to come out too much like pancakes in the middle. Do you have any suggestions for that? Hi James, I’m not sure what you mean? Too thin? Thanks for the reply Michelle! I meant that that seemed more “cakey” than a typical waffle and more like a pancake. 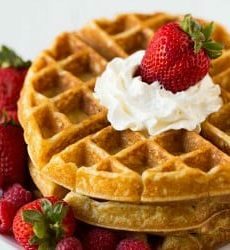 The exterior of the waffle is soft and the interior is dense and moist. While that is great in a pancake it is just not my preference in a waffle. Since then I have done some research and found using a little corn starch seems to make the waffle a bit firmer. I also started applying the bacon (and a little cheddar) to the top just before pressing down the waffle grill to ensure a good bacon ratio for each waffle. Just some small changes I found experimenting though. The original rescipe is still fantastic and I love using brown sugar with the buttermilk. I took a risk on this new recipe for a large team work event and everyone loved them! I cooked the bacon the night before and my house smelled fabulous. I brought the batter to work separately as dry ingredients, wet ingredients, and cooked chopped bacon and mixed them right before we ate them. Everything just worked out perfectly. Does the bacon have to be uncooked or can you just use the premade bacon strips that you just heat up? Hi Jeanne, I’ve never used the premade bacon strips, but if you typically use them as you would uncooked bacon in a recipe, then I think you would be fine to substitute them. I just wouldn’t want them to get over-cooked in the oven. Thanks! I’ll try this as a waffle recipe! P.S. Luv ur blog! Now that’s what I call a mifufn! What a wonderful recipe, Shanon. These look so moist, flavorful and delicious. Thanks for sharing! Looks sooooo good!!! BTW, is this a good pancake recipe too? These turned out great!! The only thing I did was swapped out the bacon for blueberries in half waffles and chopped green apples in the other half. Everything I make from your site is always excellent – keep up the good work! IHOP had bacon waffles on the menu in the 70s and it was one of my favorite dishes. Thanks for posting your recipe — looks great! Great-looking recipe! Back in the day (1960s/1970s), IHOP had bacon waffles on the menu. I used to crave them and had them at least once a month. Waffles with brown sugar, buttermilk AND bacon! Yeah, I pretty much need to make these! ;) I recently got a waffle maker, but haven’t tried it yet. This will make a flying start – probably this weekend! I absolutely love waffles…and bacon-flavored waffles? Even better! Yum! Aww man, now I’m craving waffles – these looks amazing! We make waffles every weekend and these are definitely going into the rotation! This sounds absolutely, over-the-top delicious! I always dunk my bacon in maple syrup too! So when I only saw this recipe, I knew I;ll be making waffles this weekend. I was dubious about using oil instead of butter, but they were great! Made these for our New Year’s brunch today… holy YUM! Like someone else mentioned, my bacon took a little longer to cook, but it was completely worth it. Got 12 4″ waffles using my square waffle maker. I managed to slip half of them in the freezer for later too, so I’ll get to enjoy them again! Thank you so much for the recipe and the year in review to remind me! I made them last week, they were really yummy. I’m reheating one now for brunch!